Local support can make or break your experience with any product or service your company uses. No one wants to call a toll free number, shuffle through menus to leave a voice mail, then wait days or even weeks for a call back. Wireless Made Simple has a Business dedicated team of employees, that cover Central PA, and are based out of our four locations in Bellefonte, Burnham, State College and Johnstown. We offer SAME DAY delivery on any in stock wireless device, ordered by noon, and within a one hour radius of our stores. Phones, tablets, jetpacks, you name it. 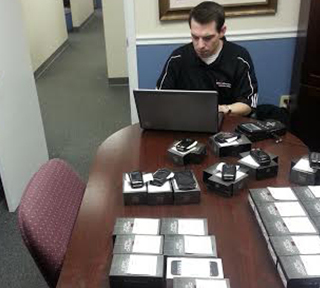 Our reps will arrive, activate it for you, transfer data, train the rep, install a device and anything else you need. We often hold trainings with new and existing clients to refresh them with capabilities, or train them on the new devices. We are always reachable, 24 hours a day by cell phone, and will return a call within an hour if you get our answering service. This method of business and support is why hundreds of small businesses from Scranton to Dubois to Somerset to Hershey all rely on Wireless Made Simple and our reps. If you are interested in seeing if we can save you money on your monthly bill and how much time we can save you and your employees, call us today for an on-site, no cost evaluation of your current plans and devices. You have nothing to lose, and might have plenty of time, money and sanity to gain by improving your current wireless setup. Call the location closest to you and ask to speak with the Business Team!